One of the definite perks of New York’s tasting season is the opportunity to meet with the many winemakers that have traveled from Austria to present their wines to wine buyers, press, trade and every other imaginable aspect of the industry. I always like to take advantage of these opportunities to not only learn something myself, but to also enable others to learn through their expertise and real-life experience. 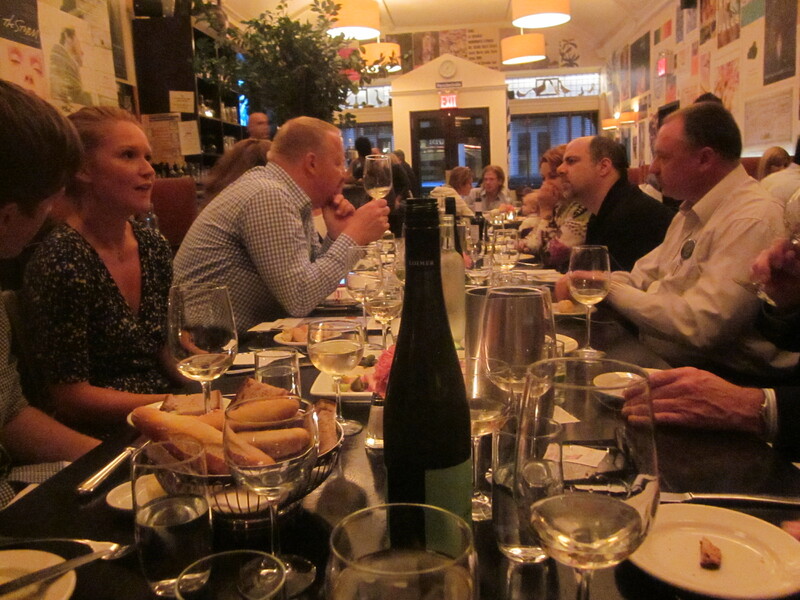 The first affair took place Monday evening at Blaue Gans on Duane Street in Tribeca, NYC. Four influential wine bloggers gathered with the group of winemakers for finger foods, a brief education and a quick taste of a representative wine. Led by Goosey and Jodi Stern of Winebow (sadly, I had no voice due to the common cold)the winema kers, wines and their stories were well received – each explained their estate and gave a little background information on Austrian wines. Fred Loimer gave an excellent introduction to the wines of Austria – he led the groups down the Danube explaining that while Grüner Veltliner has been marketing as a highly acidic, green apple and white pepper spice wine, it really is a very versatile grape that is more likely to be fresh and fruity than crisp and spicy. All in all, it depends on the winemaker. It’s also important to note that many times the Austrians do not like to be considered “winemakers” and instead prefer the term “winegrowers.” What this means is that the winemaker/grower has as little influence on the taste of the wine as possible – completely natural. Austria follows the DAC labeling system and to date, Austria currently has five DAC classified regions: They are the Weinviertel DAC (a specified Grüner Veltliner); Mittelburgenland DAC (Blaufränkisch with a varying set of characteristics);Traisental DAC, Kremstal DAC and Kamptal DAC (all Grüner Veltliner and Riesling in classic and Reserve Style). For white wine classification, Austria uses a system similar to that of Germany classifying the wines as Tafelwein (table wine), Qualitätswein (wine of quality), and Prädikatswein (“certified” wine). The categories are determined by the sugar content of the grape must, expressed according to the Klosterneuburger Mostwaage (KMW) system. However, in the Wachau, Toni explained to our interested guests, white wines are defined by different standards based on the alcohol percentage of the wines – which often correlates with quality, but generally correlates with the ripeness level of the grapes. The three categories are Steinfeder (11%abv), Federspiel (11.5-12.5% abv) and Smaragd (>12.5%abv.) This can be quite confusing to Austrian wine newbies as the Wachau is the only region that uses this classification. Thank you to all those attended and I hope I’ve brought those of you who couldn’t a sufficient sound bite!